The Presbyterian Connection newspaper is a Christian newspaper that strives to unite Presbyterians from across the country through stories, reflections, interviews and articles, allowing us to share and develop our faith. It is distributed four times per year, free of charge. The goal of the newspaper is to further equip leaders, connect congregations and missions, facilitate communication and highlight denominational work—strengthening our denominational ties across the country. The Connection is produced by the Life and Mission Agency and was first launched in March 2017, following the announcement of the closure of the Presbyterian Record. The ninth issue of the Presbyterian Connection was sent out to all congregations and subscribers in early March. Due to the popularity of the newspaper, this issue has, once again, gone up another four pages to fit all the amazing content that came in. In two years, our popular newspaper has grown from 20 pages to 36 pages, wow! Please take a moment to tell us what you like (or dislike) about the Presbyterian Connection newspaper. Your thoughts and observations are important in making the denomination’s newspaper the best it can be. Ensure you are on the subscription list by subscribing today using the button to the right, or contact the Communications Office at 1-800-619-7301 ext. 243. If you no longer want to receive the newspaper, you can unsubscribe or update your subscription information at any time. Presbyterian Connection is distributed four times per year in print, however, you can subscribe to receive an email notification when the digital copy is available. And remember, your contact information is safe—the PCC will never rent, trade or sell the distribution list. Congregations are encouraged to circulate the newspaper widely. Consider contacting church members at local retirement centres to see if they would be interested in receiving a copy. As well, in order to help reduce expensive mailing costs for large deliveries, please encourage members of your congregation to subscribe for home delivery. You can help promote subscriptions to the Presbyterian Connection by making a short announcement during your weekly worship service and distributing the Connection bulletin inserts. The bulletin insert can also be pinned on your church bulletin board. To order print copies of the bulletin insert, contact Barb Summers at 1-800-619-7301 ext. 243. We want to showcase Presbyterian people and congregations from across the country through photographs. Send us your photos from recent celebrations, youth events or retirement parties, or pictures with a guest speaker you are proudly welcoming. Help us show the faces of the PCC today! Looking for photo consent forms? Click here. If you have a story idea or information to share, please let us know! Presbyterian Connection newspaper is free of charge. However, to help offset costs and ensure the publication continues, donations are gratefully accepted. 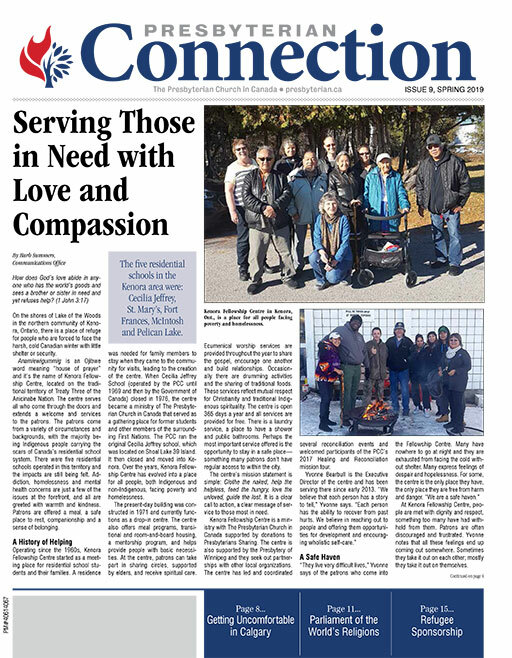 The Presbyterian Connection newspaper is distributed four times a year. Deadlines are firm. Please send all submissions to Barb Summers in the Communications Office. Note that all submissions are edited for clarity, length, style and content, as needed. Interested in advertising opportunities in the Presbyterian Connection newspaper? Please contact Stuart Teather at Fenn Company, 1-800-209-4810 ext. 23. Please note that the PCC does not endorse third-party advertisements in the newspaper and advertisers do not influence content. To cancel a subscription, please use the online form or send your request by email with the subscription name and mailing address.